French presidents have more power than the leaders of most other advanced democracies, including Germany, the United Kingdom, and, arguably, the United States. They not only command the executive apparatus, including the armed forces, but tend to drive the national policymaking agenda with little parliamentary oversight. What’s more, as head of state, the president is a powerful symbol of the French nation. Before presidential terms were cut from seven years to five in 2000, some political analysts likened the French presidency to the absolute monarchy of the ancien régime. The winner of the presidential contest in 2017 will take charge of a country at a crossroads on various foreign and domestic policy issues. Why does the 2017 election matter? The 2017 presidential election may have political and economic reverberations far beyond its borders. The National Front’s Marine Le Pen, a leading contender, has long lambasted European integration and has pledged to hold a referendum on EU membership if she wins the Elysee Palace. Many supporters of the EU fear a vote to leave by a charter member and its second largest economy may prove to be the bloc’s undoing. “After Brexit last year, if enemies of Europe manage again in the Netherlands or in France to get results, then we face the threat that the largest civilization project of the twentieth century, namely the European Union, could fall apart,” Sigmar Gabriel, Germany’s then vice chancellor, said in January. Recent polling indicates that 60 percent of the French electorate holds negative opinions of the bloc, while 80 percent say “a strong leader willing to break the rules” is needed to fix the country. The election will also influence how France responds to a number of other foreign and domestic policy questions. Economic malaise, high unemployment, trade relations, Islamist terrorism, the migrant and refugee crisis, war in Syria, and sanctions on Russia are just a few of the pressing issues that will require the next president’s leadership. The first ballot will be held on April 23, with a likely runoff to occur two weeks later, on May 7. A runoff is only held if no candidate wins 50 percent of the vote. The official handover of power typically occurs about ten days later. The mainstream political parties, the Republicans and the Socialist Party, held primaries to select their nominees a few months before the general election. Francois Fillon (Republican) – The center-right candidate served as prime minister under President Nicolas Sarkozy (2007–2012). He says major free-market reforms are needed to revive the French economy, including looser labor laws, lower corporate taxes, and extensive cuts to the public sector. Fillon supports France’s EU membership but has been an outspoken critic of the bloc’s sanctions against Russia. He has called for tightening immigration laws. Benoit Hamon (Socialist) – The former education minister resigned in 2014 to protest the Hollande government’s fiscal austerity policies. He supports a universal basic income and rolling back recent reforms that have made it easier for employers to hire and fire staff. Marine Le Pen (National Front) – The leader of the far-right nationalist party has long called for France to leave the EU and plans to hold a “Frexit” referendum if elected. She has been a critic of immigration, EU sanctions on Russia, the NATO security alliance, and free trade agreements. Emmanuel Macron (En Marche!) – The former investment banker, who served as the economy minister under Socialist President François Hollande, resigned last year to create his own political party, En Marche! (“Onwards!”). He has called for significant economic reforms, including loosening some long-standing labor-market policies. He supports EU membership and keeping sanctions on Russia. How did the current system emerge? France has passed through more than a dozen different constitutions since the Revolution of 1789, depending on how one counts. Its current constitutional regime, the Fifth Republic, was ushered into being in 1958 by Charles de Gaulle, hero of the Free French resistance during World War II. The sixty-seven-year-old statesman came out of retirement to serve as president after an uprising by French colonists in Algeria threatened to stir wider unrest. De Gaulle seized on the crisis to design a new constitution that would greatly expand the powers of the president and aimed to prevent the parliamentary paralysis that had plagued the country for more than a decade. He bolstered the French executive again a few years later, pushing through a referendum that replaced an electoral college system for electing presidents with direct universal suffrage. What were the prior republics? The First Republic (1792–1804) emerged during the French Revolution, following the removal of King Louis XVI and the abolition of the monarchy. It ended after Napoleon Bonaparte was crowned emperor. The Second Republic (1848–1852) came after another revolution that ended the reign of King Louis-Philippe. The constitutional regime was dissolved by President Louis-Napoleon Bonaparte, who was crowned Emperor Napoleon III. The Third Republic (1870–1940), which followed the overthrow of Napoleon III, was established during the Franco-Prussian War. The parliamentary democracy endured for seven decades, until the Nazi occupation. The Fourth Republic (1946–1958) was established after World War II and suffered from parliamentary stalemate and a weak executive. It collapsed amid the Algerian crisis. What is the current French system of government? Political scientists call it a semipresidential system because it has features of both presidential and parliamentary types of government. Like prime ministers in many parliamentary democracies, French presidents have supreme executive authority and significant policymaking powers. At the same time, French presidents also serve as the head of state, are popularly elected, and cannot be voted out of office by parliament. 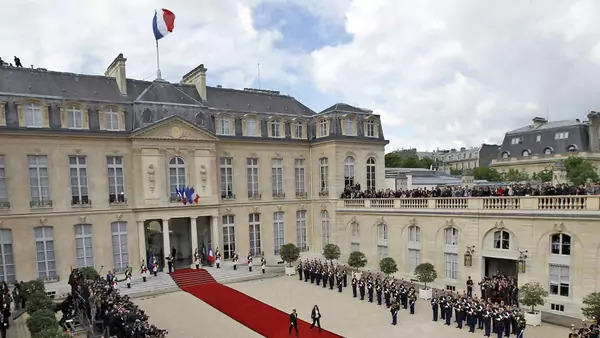 The French president appoints the prime minister, who helps implement his or her policy agenda and manage the bureaucracy with the aid of cabinet ministers. Except during rare periods known as cohabitation, sitting French presidents and prime ministers are of the same political party. The French parliament can force the resignation of the prime minister, who shares some executive authorities, but the legislative body is regarded by many political scientists as one of the weakest in the democratic world. Meanwhile, French presidents may dissolve parliament at any time and can circumvent it to enact laws in a variety of ways, including via national referendum. By comparison, in purely presidential systems, like that of the United States, clear constitutional boundaries separate and tend to balance the executive and legislative spheres. Prime ministers and cabinet officers must have the support of the majority in parliament, so when an opposition coalition comes to power in the legislature, presidents must take on a ruling partner from an opposing party. This has only occurred three times since the founding of the Fifth Republic. The last instance was in 1997, when President Jacques Chirac, a Republican, was compelled to appoint Socialist leader Lionel Jospin to the premiership after a left-leaning majority swept into the legislature. Executive power is awkwardly shared during periods of cohabitation, and presidents often choose to focus more on diplomacy and security matters, which are exclusively their province. French voters backed a referendum in 2000 to cut presidential terms from seven years to five, a constitutional reform that put presidential and parliamentary elections on the same cycle. Many supporters hoped the change would reduce incidences of cohabitation.